The WindRider 17 is the largest model in the WindRider Trimaran series. This WindRider has what it takes to get everyone out on the water. Families will love it as a day sailor with terrific stability and thanks to the large main hull the WindRider 17 will accommodate three people, plus a couple more on the trampolines. But the WindRider 17 is also the right choice for adventurous sailors, they can load it with gear and embark on a cruising escapade. Performance sailors will use the WindRider 17 with its full battened sail on a rotating mast and jib with rollreef installation for turbo charged fun. And add the optional reacher and your WindRider can easily reach 20 knots of speed! 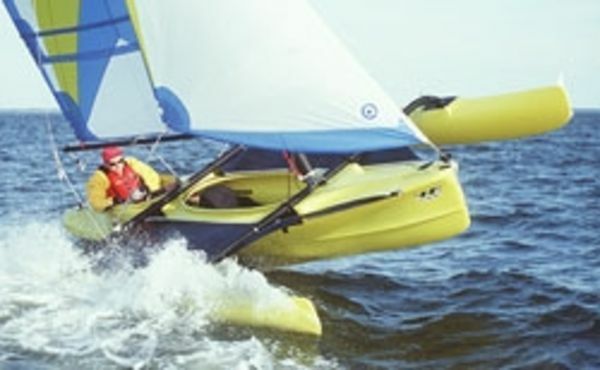 Like all WindRiders, the WindRider 17 has polyethylene hulls which are connected by special aluminium beams, and all hardware is top quality. This makes the WindRider 17 virtually indestructible.